This was a fun tray to build. I had to get really creative to find everything. The sun is next to the house and is a round yellow ball. I am very satisfied with my full sun. If it is to represent my father we had a nice relationship. I put it there feeling that it would shine down the on house. The house I chose is a sweet small but charming home. After all we need to love our house. I believe it is representing ourselves. I even found a door for it. This house doesn't have windows but my drawing had many. I feel like it is very inviting. I am standing close to the house with my watering can. In real life I water my plants and flowers everyday and smile at my little house. It has become a part of me. My first animal I chose was a dog. I put a ball and a bone for him to play with. He is very happy living in our home. I researched the dog and it shows loyalty. That is what my father taught me at a young age. He told me without loyalty you are transparent and shallow. I consider myself above all a loyal person. I also chose a horse stable and my leased horse beside the house. It is not really close because I drive to see him. Even though it is imaginary I would want to have him close. My tree is large. It has many pink flowers on it. I actually have one in my yard that blooms in the spring and summer. It is very large and beautiful. It is also close to the house and drops its flowers all in the yard. My water is a small pond. It is some distance from the house. If this is to represent my mother than there is truth in the sand. My mother and I have had many rocky times. Now as adults we are rebuilding our relationship. I love water and have real fountains in my yard.. It looked pretty to decorate with a path of flowers and a turtle. We recently found a real turtle living in our yard. Last I put in the birds and birdhouse. I have a section of my yard filled with birdhouses. We can see many types of birds flying around the house all day. 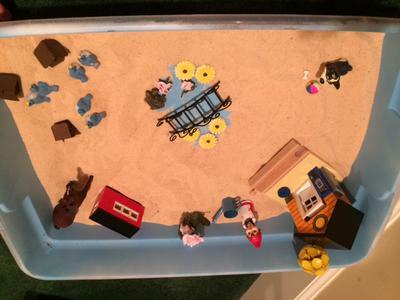 I feel very positive looking at my house for my sand tray therapy class assignment.